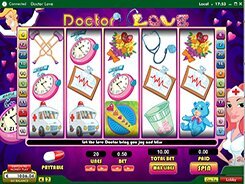 Doctor Love is a 5-reel 20-payline slot themed around healthcare with a fun and romantic twist to it. The key character in the game is Dr Love whose radiant smile makes his patients feel much better. The symbol set includes crutches, pills, a bunch of flowers, a teddy bear, and more. Accepting a single coin per line, the slot allows to customize a line bet ($0.05 to $10) and the number of active lines. Overall, a bet may range between $0.05 and $200 per spin. A wild symbol is represented by Dr Love himself; get five of them on an enabled line and grab a grand prize of 5000 coins. The wild symbol acts as a replacement for other regular icons and helps form winning combinations. The Love Meter is a scatter that unlocks 10, 15 or 20 retriggerable free spins if you hit 3, 4 or 5 Love Meters anywhere in view. During the free spins feature, all wins that you earn come at a x3 multiplier. Doctor Love is a graphically engaging, funny and fairly easy slot that would take the fancy of both novices and pros alike. PLAY FOR REAL MONEY!